This is the Diablo 3 Basics page, which is the main Fact Sheet of known Diablo III information. Regardless if you just started playing diablo 3 or returned after a long vacation to other games, this page will get you up to speed! If you are looking for the Basics Section of the wiki, you can find that in the Basics Category. Diablo III, while featured completely in 3D with a 3D environment, follows closely in Diablo II's track by using the classic isometric view, fast gameplay, and randomized content for high replayability. Some changes have been made in order to make the game more welcoming to new players, to ramp up the difficulty more smoothly, and to create a "deep and engaging" combat system. The Diablo III developers took inspiration from previous games in the series, as well as World of Warcraft, and other different games such as Zelda and God of War. Remember that if you're a newcomer to Diablo, you can find more related articles in the Basics Category. The Barbarian - The one returning class is still a mighty brawler, but he's gained countless new tricks, with only a few skills returning, and all of them modified in various ways. The Demon Hunter - The game's ranged weapon specialist, Demon Hunters are fast-moving archers with devastating offensive capabilities and a wide variety of tactical traps and demonic gadgets. The Monk - The follower of a thousand Gods, Monks from Ivgorod are holy warriors. Combining fast-hitting, melee-ranged martial arts with holy magics, auras, and defensive tactics. The Witch Doctor - A mysterious class from the jungles of Teganze, the Witch Doctor wields a huge array of magical attacks, as well as the ability to mind control enemies and summon up pets to fight alongside him. The Wizard - An evolutionary improvement from the Sorcerer and Sorceress seen in previous Diablo titles. Wizards boast an impressive array of offensive spells that are useful for every situation, as well as defensive spells and escape abilities that combine to create this murderous glass cannon. When just starting the game, you have a basic attack, which is a primary skill. The next level will unlock another skill, and so on. At level 6, you unlock skill runes, which alter the way skills work. For example, a Wizard's basic fire Hydra can use a skill rune turning it into a frost or lightning hydra. Each 10 levels up to level 30, you unlock a passive slot, which change the way your character functions. For example, there is a Barbarian passive that makes it so instead of losing fury over time, you regenerate it. All basic skills are unlocked by level 30, but it takes until level 60 for your character to reach full potential. Skills can be changed at your convenience. At level 60, changing skills makes you loose Nephalem Valor. When changed in town, there are no cooldowns. Unlike diablo 2, many skills have cooldowns ranging from 5 seconds to a whooping 2 minutes. Skills with cooldowns tend to be more powerful than normal skills and are worth the wait. In Sanctuary, you face many monsters, demons, beasts, undead, etc. They range from small, such as the imp found in crypts, or large, like the mighty Siegebreakers that are employed by lords of hell. It will be necessary to know the strengths and weaknesses of these monsters. You can begin learning about them here: http://www.diablowiki.net/Category:Monsters. In softcore, death is very mild, punished only by 10% durability loss and a need to run back to where you came from. The task is made much easier by checkpoints, which help with this, and waypoints, which make going places a very simple task. One planned feature that didn't make it into the game were specially gruesome player fatalities, which some bosses were to have the ability to inflict when they killed players. There are four difficulty levels in Diablo III, Normal difficulty, Nightmare difficulty, Hell difficulty, and Inferno difficulty. Each difficulty level repeats the same game content, but with monsters, items, and everything else increased in level to keep scaling up the challenge. Normal is designed to be fairly easy, especially early on, to usher new players into the game and teach them the ropes without too much challenge. Difficulty starts to increase in Nightmare and Hell, and characters should max out at level 60 around the end of Hell. In addition, there are 10 monster power options that increase loot drops, experience gain, and the life and damage of your foes. Gold is the main trading resource in diablo, and is common to find. It is used for repairs, buying potions and other services from vendors, trading, and the Auction House. The Auction House is a huge trading base, where you can buy and sell nearly every item in the game, excluding account bound items. It is being removed in March 2014. Barbarian swinging two magical axes. Armor and weapons function much as they did in previous games in the series. Players find low level gear early on, and one of the major goals/enjoyments of playing is to find better quality gear and thus improve your character's performance. One big change to the appearance of armor is the elimination of exception and elite versions of gear. Unlike in Diablo II, Diablo III characters will not find the exact same looking armor repeated on each difficulty level. Instead there are 18 "tiers" of armor, organized into something the developers call gear sets. Each gear set has a distinctive, organized look, and thus a character wearing all (or most) of say, gear set 14, would have a cohesive, coherent appearance as the items would match each other. The developers have released numerous screenshots of the classes in complete gear sets, and they are stylish indeed. It's less clear, in advance of playing the higher levels, just how often (if ever) a character will have most or all of the same gear set on, or if characters will always be clad in a mixture of different level equipment. Item quality is similar to that of Diablo II, with item scarcity progressing normal > magical > rare > set > legendary (unique items). There should be more mixing and matching at the highest levels, with rare, set, and legendary items of approximately-equivalent quality, depending on the random mods they spawn with. Item and weapon types can be seen below. Crafting returns in Diablo III, in a major game system that combines elements of the item crafting and item gambling systems from Diablo II. Players use the Blacksmith NPC Artisan to create semi-random weapons and armor, including (eventually) set items and legendary items. Each crafted item requires gold and materials, and crafted items all have some pre-set and some random mods, making the item creation a gamble that player may wish to repeat many times, in hopes of spawning an item with better modifiers. The Blacksmith must first know the recipe to create the item, and these are taught to the Artisans by training them to higher levels, as well as by finding crafting plans, including rare ones, as drops from monsters and chests. The Jeweler works very similar to the blacksmith, however he specializes in gems and some account bound rings + amulets, rather than gear. Armor: helms, shields, chest armor, gloves, boots, rings, amulets, and belts return. Belts are now just another piece of armor; they do not have any special potion-holding function. New armor types compared to Diablo 2: Shoulders, bracers, and pants. New class-specific armor types compared to Diablo 2: Mighty Belts for the Barbarian; Cloaks for the Demon Hunter; Spirit Stones (helms) for the Monk; Voodoo Masks for the Witch Doctor, and Wizard Hats for the Wizard. New types of weapons compared to Diablo 2: Fists, Daggers (no longer a type of sword). New class-specific weapons compared to Diablo 2: Mighty Weapons for Barbarians; Hand Crossbows for the Demon Hunter, Daibos and Fists for the Monk, and Ceremonial Knives for the Witch Doctor. Class specific weapons, off-hand only: Mojos for the Witch Doctor, Orbs for the Wizard, Quivers and 1 handed Crossbows for the Demon Hunter. Runes are no longer found in Diablo III. They were never item socketables, but were socketed into skills, until a major system overhaul in early 2012. The inventory is much larger than it was in Diablo II, and after numerous permutations, it's settled on a large grid with all items either 1x1 or 1x2 in size, which allows for many more items than Diablo 2 ever did. The stash in town is large (though it shrunk from 5 to 3 pages during beta testing), and is shared between all characters on the same account. (But not HC and normal characters.) You must buy all the stash upgrades to take advantage of the space, though. All gold and item drops from monsters, chests, quests, etc, are specific to your character. You only see items you can pick up, and do not see items for other characters, nor do they see yours in party or public games. Items dropped by a character are seen by all, and can be picked up unless account bound. Trading is supported, both between characters and in a much larger way through the Battle.net Auction House, which has two version, the gold and the real money version. Potions are much simpler in variety than in previous Diablo games. There are no mana or rejuvenation potions, just health, and they come with a long cooldown between uses. Potions are intended for emergency use only, and players must learn to survive with life leech, hit point regeneration from equipment, and by using the health globes that monsters drop. Successful players must be a bit more cautious than they were in previous games of the series. As in previous games in the series, NPCs will feature importantly in Diablo III. Much of the game story will be given by the NPCs, and they will be more interactive, while their speeches will be shorter, more to the point, and can be listened to while playing; you are no longer forced to "stay awhile" to "listen." Followers: Diablo III's answer to mercenaries from D2, the followers have their own skillset and rings, amulet and weapon slots that you can customize. In addition, you can give them follower specific items, such as the Templar Relic. Artisans: Are special NPCs who craft items and provide other essential services, as well as much dialogue and information about the game world and quests. They are the Blacksmith and Jeweler, after the Mystic was removed during beta testing. She will return in Reaper of Souls. Sanctuary world map, with locations noted. 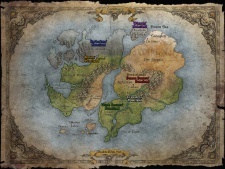 The world map of Sanctuary was actually released with the second Diablo game's manual, but a new and improved map has been made by Blizzard, outlining the continents and the major settlements. Many of these locations will be visited in Diablo III, including Tristram. Areas close by that were never visited in the previous games will also have a chance, like the Leoric Highlands and Westmarch, and much of Act Three takes place in the Barbarian Lands around the Arreat Crater. The scorching deserts of the Aranoch will be revisited by the player when they have the opportunity to visit one of the largest capital cities in Sanctuary: Caldeum. The player will also explore the depths of the Archives of Zoltun Kulle, ex-horadric mage. Outdoor areas will be less randomized than dungeons, and the terrain will for the most part be static. Instead, a lot of random scripted events will take place. You will find interactive environments with dangerous traps, obstacles, and destructible elements, such as vases and bookshelves. There will be "numerous" outdoor locations. These portions of the map that are randomised are called events, and can even happen within randomised dungeons. Some are more common than others. The land is filled with dungeons, as in Diablo II. Dungeons vary widely in size and design, and are much more randomized than outdoors. Dark Berserkers and a Grotesque in the Forgotten Tombs. Witch Doctor who's flameskulling some Walking Corpses. As in Diablo II, travel is on foot. Unlike Diablo II, there is only one movement speed, rather than a walk and run option. This speed can be increased with item mods and some skills, and there is no stamina drain while moving. There are no mounts in Sanctuary, to ride about the world at a higher rate of speed. The main method of speedy transportation in the game comes from waypoints, of which there are dozens per act, many more than were found in Diablo II. Waypoints are tied to quests and there are multiple waypoints in connected areas, tied to each quest. For instance, a player can only use the waypoint to the start of an area, and then while clearing that area and deeper dungeons within it, additional waypoints will be encountered, for easy returns to town. This allows for more travel without cluttering up the waypoints menu with dozens of them, as well as preventing players from warping right to the end of a quest, Diablo 2 boss run style. The town portal system evolved repeatedly during Diablo III's development. TPs were in as scrolls, then out entirely, then back in via the Stone of Recall system, then changed back to a town portal activated directly from the belt interface. See those pages for more details. There are numerous small Easter Eggs already seen in Diablo III during the beta testing. These include funny item and monster names, developer names carved on headstones, inside jokes via the Achievements, and more. There are certain to be many other discovered in the full game. Most fans believed there would be a secret level in Diablo III with rainbows and unicorns and happy clouds, based on various hints and jokes the developers had been making stemming from the art controversy. The fans were right, as Whimsyshire, the Diablo 3 secret level, was found shortly after the game's release. See that article for full details. 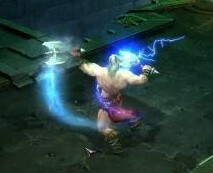 Diablo III uses more color, or at least uses color more obviously, than previous games in the series, and this spawned numerous fan debates shortly after the title was revealed in June 2008. The early screenshots and gameplay movies sparked the art controversy and angry online petitions, which Blizzard reacted to by defending their design choices. The Art controversy article goes into great detail on this topic. Mystical comet overlooking a settlement in the western part of Sanctuary. The story line of the game takes place twenty years after a few powerful heroes saved Sanctuary from the demonic onslaught in Diablo II. Those events took place out of the sight of the common populace, and have become myth or legend over the intervening years. Most of the principles are dead or insane, and no one has had any sight of the Archangel Tyrael since he destroyed the Worldstone, triggering an explosion that erased Mount Arreat and shattered the Barbarians' civilization. Since the destruction of the Worldstone, those few humans (such as Deckard Cain) who did know of the danger to the world have been expecting an imminent demonic invasion, without the Worldstone to keep them in the Burning Hells. This has not happened because, and players will eventually learn, the two remaining lords of Hell, Belial and Azmodan, have been building armies for a full-on invasion, intended to utterly destroy humanity. Unlike the blank cyphers that all characters were in previous games in the series, the individual characters in Diablo III will have personalities. The Wizard is young, brash, and headstrong. The Monk is powerful and quietly confident. The Barbarian is strong and stoic. The Demon Hunter is angry and reckless in her (or his) need for vengeance. And the Witch Doctor is spiritual, mysterious, and misunderstood by the populace at large. The characters behave accordingly, and inspire different replies and behavior from the NPCs. The Followers such as the Templar and Enchantress each have a distinct personality with a fleshed-out background and will not only banter to the player character, but also to other NPCs (and even to each other within the camp or town). The same holds true for other NPCs, such as Leah, who may on occasion follow the player into the fray during a quest. There are a lot more quests in Diablo 3 than Diablo 2, at least 10 each act. They are all manditory to progress though the game, although that is subject to change in the expansion. Quests can be repeated in Diablo III through the game creation menu. The main focus of Diablo III is co-op PvE style play. Up to four players (yes, just four) can join up in a game and play together, and players in the same game are always friendly and in the same party. Players can, however, do some Brawling. Game creation and group formation will be easier in Diablo III than in the past: it is mostly automated. Diablo III, being on "battle.net 2", is using a match-making system very similar to that which is seen in ladder play in StarCraft II or the dungeon finder in World of WarCraft. A player can choose a few options for their game, including whether or not they want it to be private, , which quest they would like to start on (if they don't wish to simply resume the quest they were last playing), and a tag (Monster Slaying, Key Warden or Brawling). Players can instantly join games in which people on their Friends List are playing. Diablo III takes place over Battle.net. There is no offline mode: the game is online only. Diablo III is following in Starcraft's footsteps and does not include LAN support. Though Blizzard always claims that this is a benefit, enabling greater player connectedness, most players regard it as an annoyance implemented as a security feature, since all Diablo III play requires players to possess a Battle.net account and valid cd-key. A new round begins in the Battle Arena. Arenas were first delayed, then delayed again, then replaced by Brawling with the promise better would be coming out. 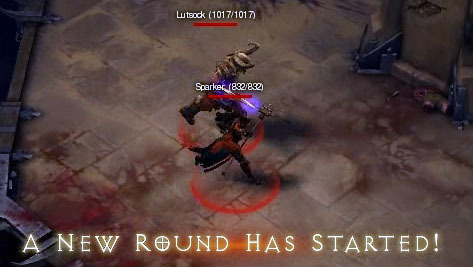 So far, no improvements have been made to pvp in Diablo 3. Battle.net 2.0 for Diablo III includes a Friends List, numerous matchmaking and automatic game joining options, and limited chat channel support. Chests will not ever spawn in a locked version. Monster corpses are no longer something that players can interact with. There are no corpse skills like Diablo II's Corpse Explosion or Find Item, and bodies on the ground will vanish after certain criteria have been met. However, dead bodies can be affected by physics. There are no player corpses either, in the sense of lootable objects as they were in Diablo II. Like monsters, dead players are subject to the game's physics and can be blasted aside or out of sight by spells, and will vanish after a few seconds. See the System Requirements article for full details on minimum and recommended system specs for PC and Mac. The Diablo 3 beta test began in early September, 2011, and continued through the end of the year and into 2012. The frequency of patches and number of beta testers increased dramatically in early 2012, as the game neared completion and balancing changes grew more frequent. Prior to the start of the test, the developers had repeatedly said it would be a quick beta test, devoted largely to technical issues and Battle.net stress testing. That turned out to be very untrue. America (ERSB) - "M" Mature Rating (player should be at least 17 years old). No law enforcement. Europe (PEGI) - 16+ (player should be at least 16 years old). No law enforcement (for most countries). Germany (USK) - USK 16+ (player should be at least 16 years old). Law enforcement of USK. Read more in the ratings article. Blizzard Entertainment , with the Diablo III Game Director being Josh Mosqueira. Jay Wilson was formerly the Lead Designer and Game Director, but quit. Mike Morhaime said they would like to make Diablo III expansions annually, and confirming plans for multiple expansions for the game. So far, Reaper of Souls has been announced.